In 1980s in many European countries telephone companies tried to introduce telephone-based text information systems. In Germany it was Bildschirmtext. In France, it was Teletel/Minitel (first with device connected to home TV set, then CRT terminals). 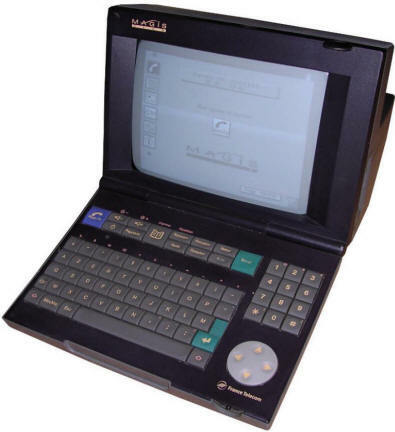 In France Minitel network has been operating until 2012 and it was still popular when shut off. Why? It allowed to use many services, had simple catalogs (without excessive spam, like in today's Internet) and had boards to communicate easily. 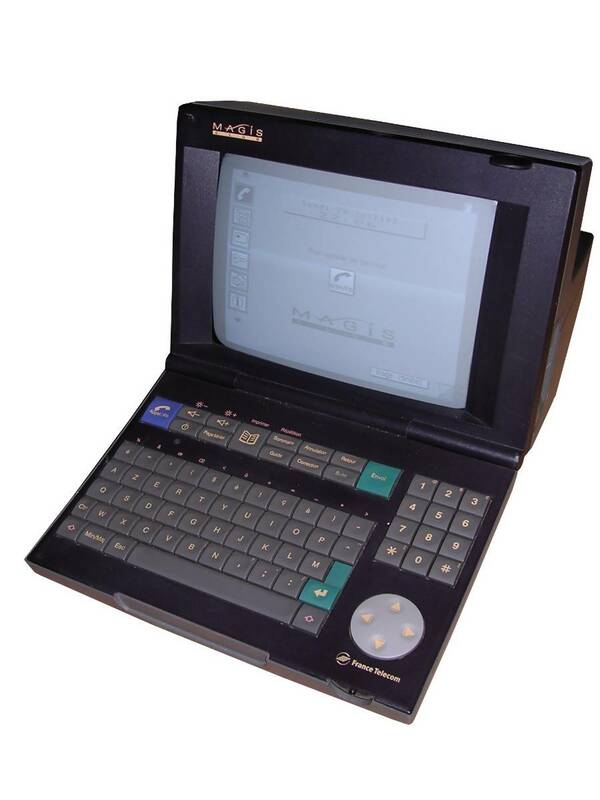 Since 1980s Minitel terminals became better and had additional capabilities. This unit is a Minitel terminal from late 1990s. It can connect to Minitel, act as telephone book and even decode JPG files to its greyscale CRT. Services can be authenticated using chip card, so only card's holder may use services he paid for. Earlier it was password authentication of authentication based on phone number (temrinal was connected to home line). This unit is Revision 2 of Magis Club terminal. The first one, released in 1996, had simpler software. Last units have been manufactured probably in mid-2000s. Keyboard: Built-in, membrane with cursors and numeric keypad. My unit is in a good condition. It works, it can emit sound and beep telephone numbers. It was manufactured in 1999, plastic cover in 1998. Contrary to earlier Minitel or German Bildschirmtext units it is made to be cheap and efficient - it has a very small amount of electronics and a whole logic part is made in a PCB smaller than palm. It is based on National Semiconductor 32-bit microcontroller, 256kB and 32kB of RAM, I don't know which one is the video memory. Its card reader also seems to work. Looking inside, it can be seen that manufacturer (boards are marked "Alcatel") saved as much as possible. There is no thick insulation between power supply/CRT PCB and bottom of casing - only layer of paper. Speaker is held in casing by a rubber band. All components are soldered in - even card reader ribbon cable. The only thing which can be removed is logic PCB. Manual in French. If you can understand (or Google translate) French you should peek a bit there, it's a forum which still has the atmosphere of old Minitel forums. (Non-French IPs seem to become blocked, unfortunately, Local mirror). After powering on it should beep, then green LED stays on and nothing happens. Press the power button or blue handset key. It should jump to dialing mode and CRT should light up with number entering window. In terminal mode, CR is Shift+Return. 1. Using flat screwdriver pry both bottom hooks by pressing them. 2. Do the same thing with two hooks on the top side. 3. When the rear part comes off a bit, use needle-like screwdriver to pry upwards another hook in the middle of top casing, hidden in vent aperture. 4. After unlocking, slide the cover a bit more. Now pry the speaker part from the rear and remove it by moving inside through its hole (rotate it properly). The speaker cable is soldered to mainboard and there is no way to disconnect it. 1. TTL 5V RS232, 1200bps 7bits or 9600bps 8bits, configurable in software (key icon -> Regle... -> Prix peripherique or something like this). In the manual it is written that it can also go with 4800bps, but I haven't found this setting in my unit. 2. In the manual, the connector shown (probably male connector) has different numbering than connector in the "Connecting to PC using serial port" site. So I've just measured my unit to check where I have this 8.5V auxiliary power (it's unregulated).